Here we go round the Mulberry bushes! 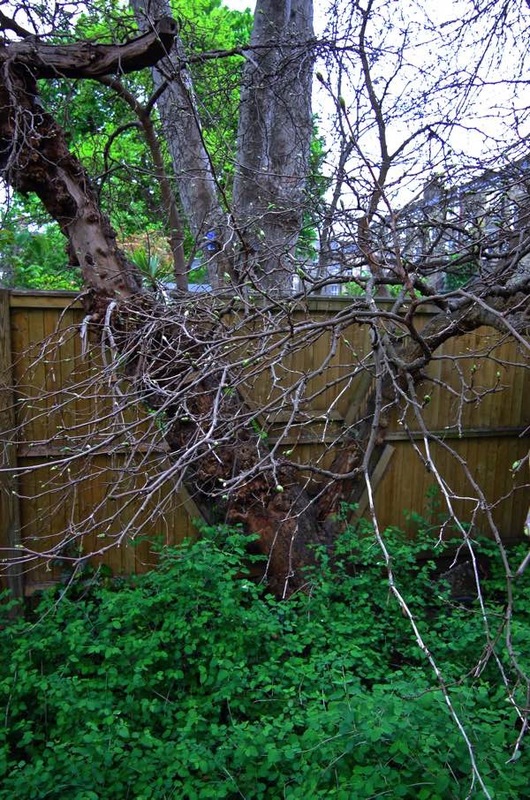 After I featured the Bethnal Green Mulberry last week which – at four hundred years old – lays claim to be the oldest tree in the East End, I was contacted by a reader who introduced me to the ancient Haggerston Mulberry and then, over the weekend, I was invited up to Hackney to meet the Dalston Mulberry. 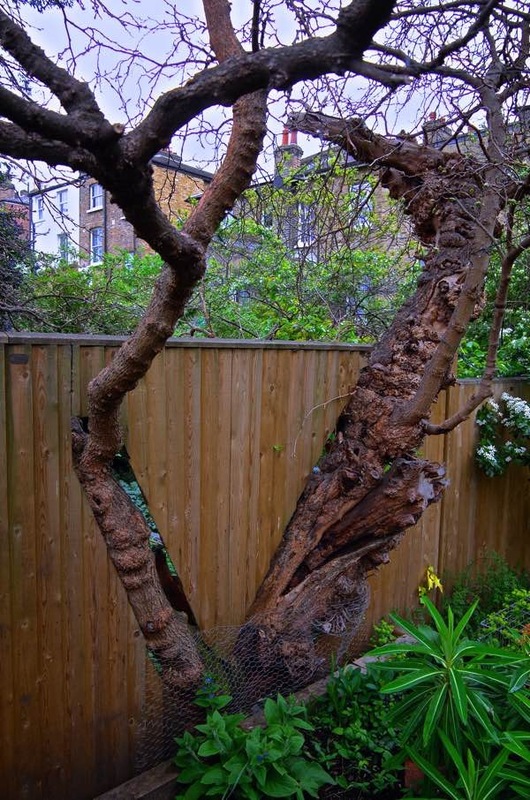 Secluded in gardens behind a nineteenth century terrace near London Fields, the Dalston Mulberry grows upon the boundary of two properties and consequently has two custodians, neighbours Molly and Megan. 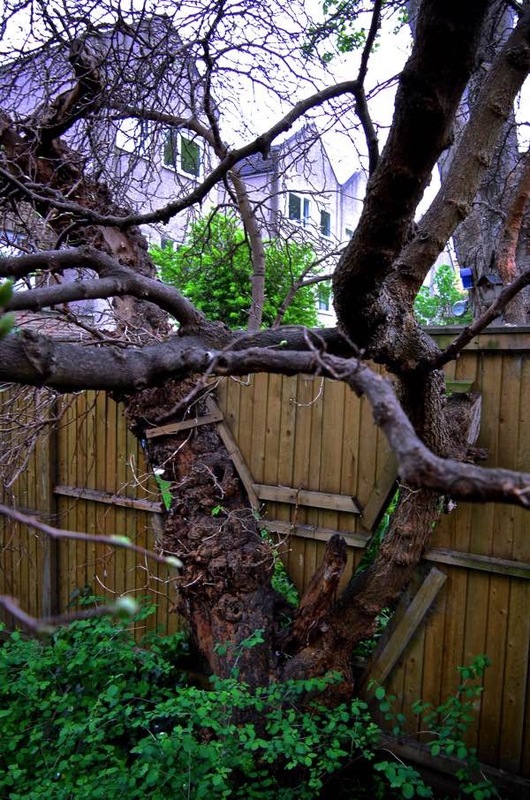 When the fence was replaced in recent years, it was painstakingly constructed around the cherished Mulberry so that residents upon either side might enjoy its fruit and benign influence equally. In the same street, there are several early-eighteenth century cottages and it seems likely that Dalston Mulberry is their contemporary, planted three centuries ago. For years, I wondered what happened to all the Mulberry trees. Since the East End was home to a thriving silk industry for generations, they must have been ubiquitous once and I could not believe they had all gone. In each case, the Mulberries I have met predate everything that surrounds them and it fills me with humility to encounter these gracious specimens, which have mastered the art of longevity – by producing a generous crop of fruit each year, they ensure their survival and earn their right to exist in spite of all the changes. Now the venerable Mulberries of the East End are emerging from the shady groves where they have been sequestered for centuries and declaring themselves, who knows what horticultural discoveries may lie ahead? Should you wish to visit an out of town mulberry there is an ancient one in the (public) gardens of Southover Grange in Lewes, the house was once owned by the family of John Evelyn, he planted mulberries at his home at Sayes Court in Deptford where a mulberry reputed to have been one of his survives. In the 1970s my grandfather took me to the former home of Sir Henry Royce in West Wittering where he had done a number of jobs as a carpenter, the house was being renovated and he knew the builders. We picked mulberries from the tree there, my first taste and a precious memory. It would be nice to see them later on in the year when they are bearing fruit. I was born in Bow and lived there until i married and now live in Essex. I am 71 years old and I went to morpeth street school. My maidee was Claisse. Our school badge had a mulberry tree on it and I wonder if the tree is in the playground! Or was it ever there? Why are mulberries never seen on the stalls at farmer’s markets or in dishes in restaurants? Given the lengths that are gone to these days to forage produce for cooks it is a puzzle. The fruit is delicious, with a rich and complex taste: my mother used to make summer pudding using mulberries and raspberries together, and a wonderful jam. What a beautiful piece. I love that it starts with the echo of children chanting their rhyme. The story goes that King James the Sixth and First (under the influence of William Stallenge) wanted mulberry trees planted in order to develop an English silk industry. The king had 4 acres planted in Westminster and ordered all counties to plant some 10 thousand trees for this purpose. Stallenge did well out of this and published a book on their cultivation. Unfortunately the English silk industry never got off the ground. The trees imported were of Black Mulberry, whereas the silkworms thrive on the leaves of the White Mulberry. Proper Preparation Prevents Poor Performance ! You asked for other gardens with Mulberry Bushes. The garden in Throgmorton Avenue of the Drapers’ Company is home to both an old and new mulberry trees. We are enjoying this series in this household since about 7 years ago we planted a very small King James’ mulberry in our Stratford garden purchased from the wonderful Habibi family run Keeper’s nursery in Kent. We were warned that it would be several years before it produced any fruit and that has proved to be true. Every year we peer in expectation that fruit will appear but so far there has been none, although the tree is growing very healthily and so hope remains. In the meantime we content ourselves with regular visits to the mulberry in Bunhill Fields. To the lady who asked why you don’t see mulberries in supermarkets, they are the most gloriously anti-corporate fruit and have resisted just about every attempt at industrialisation – they can take decades to mature enough to fruit; the branches are so delicate they’re impossible to climb, even just shaking the tree can damage them permanently; the fruit turns to mush almost instantly upon leaving the tree. It’s almost impossible to pick them and take them home or to market, let alone to a supermarket. You can barely run up the garden and throw them in a pre-prepared jam pot! I pick and eat them every year two streets away from my house, it’s a glorious few days (oh yes, and the season is very short and they won’t ripen artificially!) sitting on a wall watching the world go by. There’s also a fine and productive Mulberry in the grounds of the former St Clements Hospital in Mile End. In a time when we usually read of neighbours arguing about property lines and who-owns-what it is refreshing to see that the two women worked together to preserve the tree and its history. “Good fences make good neighbours” indeed! Not in east London, but there’s a splendid mulberry outside Hogarth’s house in Chiswick, which dates back to his times, but may date back even further. well street common user group planted two mulberry trees about 5 years ago, as part of a 15 tree orchard on the Common. They have not fruited yet but are just coming into leaf. I gather that they sometimes take up to 15 years to bear fruit so we await patiently! I remember keeping silk worms as a child and having to walk quite a distance regularly in the right season to pick leaves for them to eat; we were fascinated by the process from chrysalis to worm to butterfly (moth?) but never got as far as actually making anything from the silk cocoons. Then there are the 2 mulberries planted in Fountain Court, Middle Temple in 1887. My secret lunch spot is one of the stone benches underneath…but don’t tell anyone!